We are so excited to introduce the event emcees of our Inaugural Fallen Patriots New York City Gala - John Elliott, CBS News Personality, and Colonel (Ret) Jack Jacobs, Congressional Medal of Honor Recipient and Fallen Patriots Board Member. 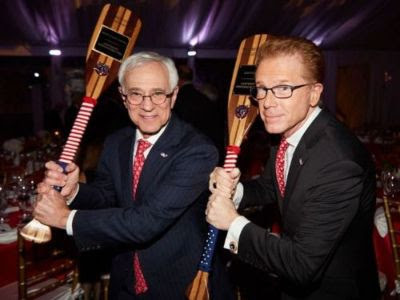 They have hosted the Fallen Patriots Greenwich Gala together for many years and we are honored to have them host the New York Gala on May 22nd. We hope you will join us to celebrate the success of the scholars we serve! John Elliott joined CBS 2 in January 2007 as a meteorologist on "CBS 2 News This Morning" and "CBS 2 News At Noon." Prior to joining CBS 2, Elliott worked two years at KCBS-TV in Los Angeles. Before that, he spent two years with NBC News and MSNBC, appearing weekday mornings on NBC as a weathercaster on "Early Today." He also handled a wide variety of assignments as an anchor and correspondent on MSNBC. Elliott served as a 2004 MSNBC presidential campaign correspondent in the battleground state of Iowa. He also reported from numerous bases and posts throughout the nation as troops were deployed for the war in Iraq, and spent time onboard the USS Abraham Lincoln. Prior to joining NBC, Elliott worked for XETV-TV in San Diego, where he served as an anchor to the Fox station's morning newscasts. He was also a morning news anchor for KGET-TV, the NBC affiliate in Bakersfield, California. Elliott began working as a weathercaster, first at WRBL-TV, the CBS affiliate in Columbus, Georgia, then at KGET before making the transition to his role as a news anchor in Bakersfield. Jack Jacobs was born in Brooklyn, New York. He holds Bachelor's and Master's degrees from Rutgers University and entered the U.S. Army in 1966 as a Second Lieutenant through the ROTC program. He served as a platoon leader in the 82nd Airborne Division, executive office of an infantry battalion in the 7th Infantry Division and commanded the 4th Battalion, 10th Infantry in Panama. A member of the faculty of the US Military Academy, Jacobs taught international relations and comparative politics for three years, and he was a member of the faculty of the National War College in Washington, DC. He was in Vietnam twice, both times as an advisor to Vietnamese infantry battalions. For conspicuous gallantry and intrepidity in action at the risk of his life above and beyond the call of duty, Capt. Jacobs (then 1st Lt.), Infantry, distinguished himself while serving as assistant battalion advisor, 2d Battalion, 16th Infantry, 9th Infantry Division, Army of the Republic of Vietnam. The 2d Battalion was advancing to contact when it came under intense heavy machine gun and mortar fire from a Viet Cong battalion positioned in well fortified bunks. As the 2d Battalion deployed into attach formation its advance was halted by devastating fire. Capt. Jacobs, with the command element of the lead company, called for and directed air strikes on the enemy positions to facilitate a renewed attack. Due to the intensity of the enemy fire and heavy casualties to the command group, including the company commander, the attack stopped and the friendly troops became disorganized. Although wounded by mortar fragments, Capt. Jacobs assumed command of the allied company, ordered a withdrawal from the exposed position and established a defensive perimeter. Despite profuse bleeding from head wounds which impaired his vision, Capt. Jacobs, with complete disregard for his safety, returned under intense fire to evacuate a seriously wounded advisor to the safety of a wooded area where he administered lifesaving first aid. He then returned through heavy automatic weapons fire to evacuate the wounded company commander. Capt. Jacobs made repeated trips across the fire-swept open rice paddies evacuating wounded and their weapons. On 3 separate occasions, Capt. Jacobs contacted and drove off Viet Cong squads who were searching for allied wounded and weapons, single-handedly killing 3 and wounding several others. His gallant actions and extraordinary heroism saved the lives of 1 U.S. advisor and 13 allied soldiers. Through his effort the allied company was restored to an effective fighting unit and prevented defeat of the friendly forces by a strong and determined enemy. Capt. Jacobs, by his gallantry and bravery in action in the highest traditions of the military service, has reflected great credit upon himself, his unit, and the U.S. Army.